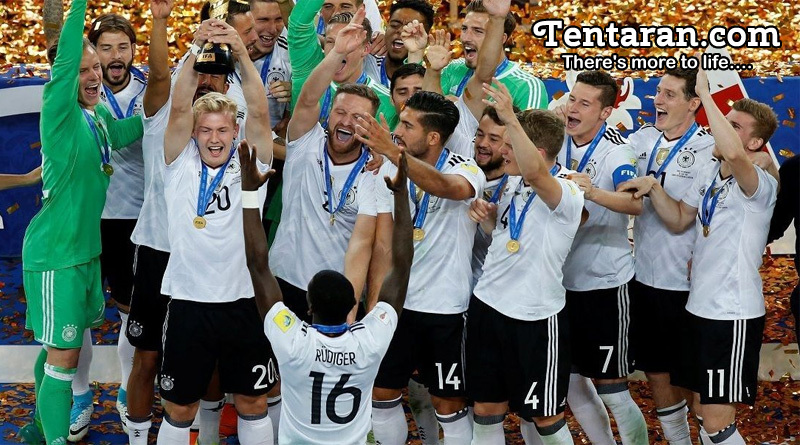 World champions Germany secured a first Confederations Cup title after they edged past Copa America winners Chile 1-0 in the final in St Petersburg. Two days after their under-21 squad won the European Championship, a weakened senior team – eight of whom are eligible for the U21 side – beat Chile in a thrilling game to lift the Confederations Cup. Lars Stindl hit the first-half winner following a horror mistake by Marcelo Diaz. The final began with a surreal all-singing, all-dancing closing ceremony, which paid homage to Russian history and past Confederations Cup winners. As fans filed into Saint Petersburg Stadium dipped in glorious afternoon sunlight, a giant Mexican sombrero, the former Brazil striker Ronaldo and Russian pop stars graced the field. Despite both nations playing five games in 14 days neither manager made concessions to fatigue; South America’s champions, Chile, named an unchanged line-up while Germany only replaced one defender. Chile started strongly and had the better of the opening chances as Alexis Sanchez threatened as he floated between the 3-man German defence. Germany launched a rapid counter-attack after Chile failed to latch onto a golden opportunity in the 19th minute. Although Chile initially neutralized the move, a terrible mistake by Marcelo Díaz allowed Werner to collect the ball inside the penalty area. He passed across an empty goal to Lars Stindl, who tapped in for his third goal in four games. Chile pressed with even more intent in the second half and the German defence which was strongly tested stood resolute against all attacks. Tensions ran high and the latter stages were punctuated by on-field disputes. Vidal and Joshua Kimmich were booked following one spat while the game threatened to descend into violence when frustrated Chile players piled on a prone Emre Can in an attempt to retrieve the ball. Fifa’s video assistant referee (VAR) technology was once again under the spotlight after Chile’s Gonzalo Jara remained on the pitch despite landing an elbow in Timo Werner’s face during a second-half challenge. The ill-tempered conclusion did not distract Germany though who hung on to win the final 1-0. With another title there can be no doubt that Germany are the best footballing nation in the world. They won with their reserve side, went top of the FIFA rankings, and they appear to be favorites already for the World Cup next year.